I hope this post finds you well and that you are enjoying the cooler Fall weather. I just wanted to give you a sneak peak at the new content that will be added to the site during the month of October. I have a Filson 238 Outfitter Bag (Large) in Otter Green scheduled to arrive any day now and I will be posting my initial thoughts/impressions after the unboxing. This month, the bag I will be reviewing is the Filson 240 Carry On Bag (Small). I consider it a wonderful hybrid bag, because it works equally well as a daily carry (messenger-style) bag as it does a travel bag for short getaways. I will be posting lots of great pics and telling you everything you could ever want to know! The question I am most often asked, especially from those looking to buy their first Filson bag, is whether to buy the 256 Original Briefcase or the 257 Briefcase Computer bag. These bags are similar enough in both their size and feature-set to cause considerable confusion for the first-time buyer. In the Ultimate Briefcase Comparison, I will be breaking down the differences and explaining how the pros/cons of each bag should guide your final decision. I will also be posting lots of great side-by-side comparison pictures so that you can get a better idea of which bag is best for your particular needs. As you can see, we have a busy month planned. Thanks for visiting and please stay tuned! Looking forward to your 256/257 review. I don’t have a Filson outlet where I live, so I would have to buy sight unseen, and I’d like to make sure it’s the right bag for me. Most shots of the bag on the internet barely give you a peek inside or convey how big the bag is, what it can store, etc. I don’t usually spend that kind of money on bags, so it’s kinda important I get it right! With all due respect, I just had my Filson briefcase returned after being informed the canvas would not support stitching of new straps. The straps were worn from many years of use and probably oil from my hands. However, the canvas was capable of supporting stitching of new straps and would have lasted many more years. I’m really not interested in a new bag. The old one has lasted and would continue to last for many more years. . The old Filson would have fixed this. 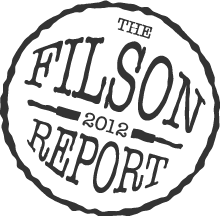 The new Filson has a new standard of what they’ll stand behind. I’m not a casual Filson customer. I’ve purchased their products for many years. My great-grandfather used their products and my brother logged in their tin pants. Not standing behind their products represents a bad trend. Thanks for your feedback, Richard…I am sorry to hear that your bag wasn’t able to be repaired.